If you are suffering from depression it is important to get proper medical advice on how to deal with it. But you may be able to help yourself in some ways as well – most specifically with exercise. 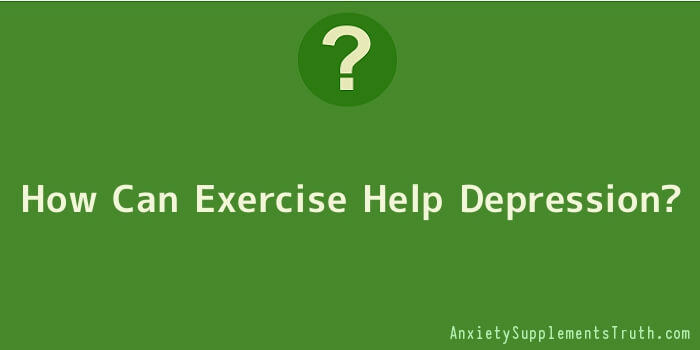 If you’re asking yourself how exercise can help depression, the answers you want are below. Keep reading and try applying some of the advice given. You may be surprised at the results. Does Exercise Have The Power To Make You Feel Good? Yes it definitely does. Exercise is known to release feel good hormones that improve anyone’s mood. Think back to times in the past when you have felt a little flat or disinterested in life. If you made the effort to get some exercise you can probably remember feeling better as a result. This is why doctors will often recommend taking exercise – which is good for us anyway of course. It can lift the mood and reduce the symptoms felt by people who are suffering from a mild form of depression. When it is done regularly it can have quite a noticeable effect. It may help people with mild depression, but supposing the depression is more pronounced? Providing you don’t overdo it, the act of getting regular exercise cannot harm your efforts to reduce the level of depression you are suffering. Indeed if you can get out every day and make the effort to get even just a little exercise, you may start to notice the difference it makes. Some people struggle to even get up or go out when they are suffering from depression. If you can go out, even if you are in the company of someone else, you will be pulling yourself out of the situation you are in. This can help to focus your attentions on other things and promote a healthier frame of mind. Does The Obvious Positive Physical Effect That Exercise Can Have Also Play A Part? It’s certainly thought that it does, yes. The question ‘how can exercise help depression’ can be answered in the way you feel better about yourself when you look and feel more toned and fitter than you were before. Over time the cumulative effects of regular exercise not only enhance your body, they will enhance your mind as well. These in turn can reduce the symptoms you experience with your depression. You may find your chosen form of exercise becomes a release from your depression too. If you choose a form of exercise that you will really enjoy, you can look forward to doing it on a regular basis. This can take your mind away from thinking about feeling depressed all the time. Is It Best To Start Slow With Small Steps? Yes definitely – especially, if you have severe depression and you have been staying indoors a lot, you may wish to start small. Even the smallest step in the right direction can have pronounced positive mental effects. For instance challenge yourself to simply go outside and walk around the block. It may only take you five minutes – depending on where you live – but when you achieve it you will feel good that you made the effort. If you don’t feel able to do that, walk the length of your garden instead. Or maybe try some gentle exercises indoors. Walk up and down stairs for a couple of minutes if you have stairs. Anything that will get you motivated to do more and shake you out of your normal routine could work.